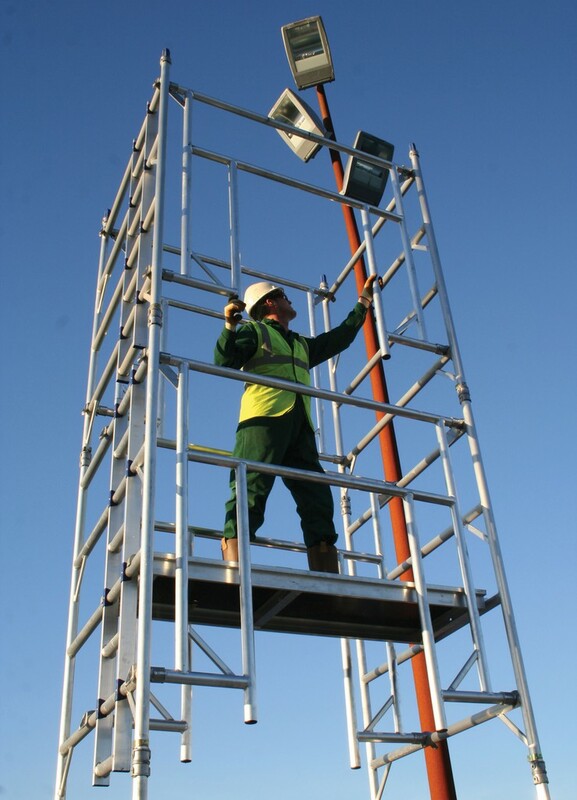 The aim of the annual initiative is to improve height safety, develop industry knowledge and skills, and connect with a wide range of tower using industries - from construction and maintenance to facilities management and retail. 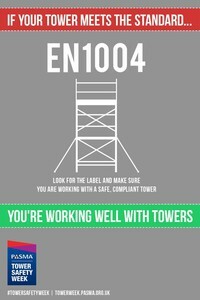 Throughout Tower Safety Week - now in its fifth year - tower users everywhere were asked to show their support for tower safety. PASMA members, their customers and industry at large also celebrated the versatility of towers and their increasing use in a wide range of different and challenging applications. Resources for 2016 included new infographics, updated fact packs and the return of old favourites such as the High Tower Challenge and the See a Tower, Take a Selfie! competition, aptly re-named Tower Selfie Go! for 2016. Also new this year were CPD Instructor Open Days. These were arranged across the country to augment and update the skills and competence of PASMA instructors. Held at the premises of PASMA manufacturing members, they were designed to keep instructors abreast of the latest developments in tower technology, design and safety. Amongst those taking part were Aluminium Scaffold Towers, Euro Towers, Instant Upright, Lyte Towers and Ladders, Pop Up Products, Turner Access, UTS Sales & Repairs and Youngman/WernerCo. Specifically produced for PASMA Tower Safety Week, a set of infographics were used to explain and highlight the two approved methods for assembling and dismantling towers - ‘through the trap’ (3T) and ‘advanced guardrail’ (AGR) - the importance of tower training, and the need to properly inspect and record the condition of a mobile access tower in accordance with the Work at Height Regulations. 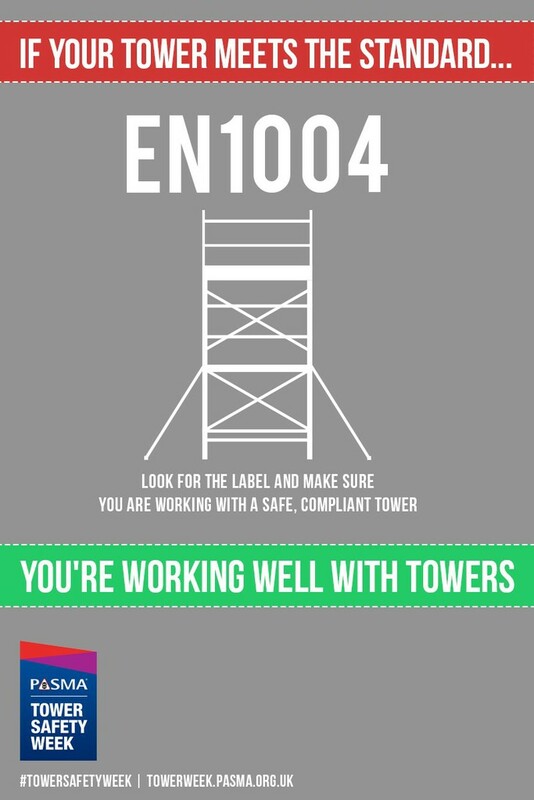 Throughout the campaign, again using a simple infographic, the Association continued to warn of the dangers of using incomplete and unsafe tower scaffolds that do not comply with European tower standard EN 1004. This follows in the wake of PASMA’s and HSE’s concern about the number of incidents involving the use of sub-standard, poorly constructed and, in some cases, downright dangerous towers. 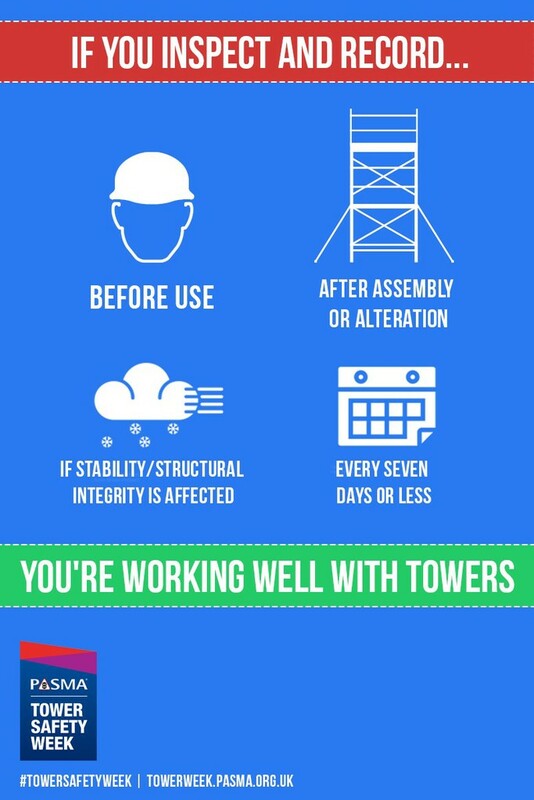 The Tower Safety Week website also provided a huge range of information and resources focusing on safety and best practice, including downloadable leaflets, guides and videos on topics such as: how to look after your tower, essential points to owning a tower and many more. A group of highflying PASMA members signed up to the High Tower Challenge. Using the figures they supplied, PASMA worked out the total height of all the towers assembled over the course of the week by them and compared it with famous landmarks. This year saw participating members reach an impressive combined height of 2981m (towering above Mount Olympus). For every metre assembled the association donated £1 to a member’s charity of choice picked at random, which was revealed to be MacMillan Cancer Support. This novel challenge invited people to take and submit photographs of as many different types and configurations of towers as possible. The winner was Richard Chapman of HCS Safety who submitted six images covering everything from standard 3T and AGR units to towers on stairs and low-level podium steps. On a lighter note, PASMA members and the public at large were asked to submit interesting, unusual or humorous selfies taken with a tower - featuring foam hands. Significantly, PASMA Tower Week culminated, not in the UK, but in Dubai where the association sponsored the first ever one day Middle East conference dedicated entirely to the safe and productive use of mobile access towers. Attended by more than 120 delegates, the event included presentations, panel discussions and practical demonstrations.